If you could hop on a plane to your next travel adventure, where we would go? Here at Experience Tacoma, our team is dreaming of a tropical Hawaii vacation. As a reader, you’re in luck! Experience Tacoma has partnered with Alaska Airlines and South Sound Proud to bring you the Fly Like The Mountain Is Out Giveaway! 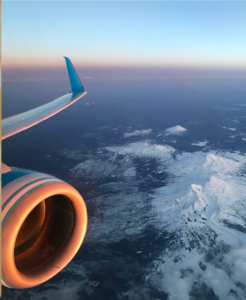 To show their love and appreciate for the South Sound community, Alaska Airlines was gracious enough to give away a pair of round trip flight vouchers for one lucky winner. The winner will get to choose any destination that Alaska flies in the U.S, Canada, Mexico and Costa Rica (excludes Cuba and Barrow, AK.) This prize is valued at up to $1,120. We’re incredibly proud to be a part of this giveaway with our friends from Alaska Airlines and South Sound Proud, as it is our way of giving back to the community. While anyone can enter for a chance to win, we’re promoting this giveaway in the South Sound only and we do hope a local resident is chosen! Be sure to tag your travel partner in the photo so that they can enter as well! To qualify, you must have a public profile. One entry per person. The giveaway ends 12/14/17. The winner will be notified through DM on 12/20/17. The Giveaway is open to U.S. citizens, age 18 and up. For official terms & conditions, click here.